Among other things, a shared sense of purpose can go a long way. B+H Toronto team participating in the Heart and Stroke Foundation’s Ride for Heart. According to Sebastian Junger, “When people are actively engaged in a cause their lives have more purpose… with aresulting improvement in mental health.” Image courtesy of B+H. On a recent commute, I was drawn into an interview on NPR with Sebastian Junger on the subject of his recent book, Tribe: On Homecoming and Belonging. As he spoke of returning veterans’ difficulty transitioning back into civilian society and the insight their experience provides about the health of our society, I began to wonder what this insight might mean for the role that today’s workplace plays in organizational life and human outcomes. Is combat or culture the culprit? A key premise of the book is that, despite the harrowing wartime environment, warriors experience a shared sense of task and purpose, held by their unit (“tribe”) for which there is no counterpart in civilian society. Jurgen proposes that the PTSD many vets experience on their return from the battlefield may well have less to do with their combat experience than with the current state of our culture. Contemporary American culture abounds with individual autonomy but provides vastly diminished opportunities to experience the sense of belonging to a community. Commentary on the decline of community in American society is not new. It was first brought to our attention in 2000 in Robert Putnam’s Bowling Alone: The Collapse and Revival of American Community. Few, if any, have offered an alternative take on this apparent cultural and societal trend, a trend that any of us, when pausing to reflect, sense intuitively. There is a pronounced and widespread yearning for community in a society and culture where it is increasingly hard to find. Does community have a place at work? So what does this mean for the workplace, and why is it even relevant? It matters because those who are paying attention know from generational research that Millennials and Gen Z express a significantly stronger desire for community and service than their predecessors. Leading companies have taken notice. When success hinges upon the ability to attract and retain the best and brightest, and with Baby Boomers retiring at the rate of 10,000 per day, the ability to create community and a sense of belonging in the workplace creates a powerful competitive edge. Community service is now integral to many companies’ employee packages, but Google has gone a step further and, in response to employee demand, allocated on-campus space dedicated to community service. Boeing offers volunteers and subject matter experts to STEM programs in local schools. From these and other examples, a macro case can be made that the boundary separating companies from community has become substantially more permeable than in the past. But what about the micro case…community in the workplace? 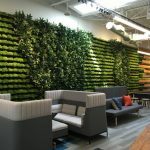 Coterie Worklounge in Seattle is billed as a “co-working space for grown-ups.” 30 percent of Coterie’s membership has corporate offices within walking distance but choose to work here instead. Image courtesy of B+H. Is the office the new village? For the design community this understanding provides an opportunity to take a fresh look at the potential of a workplace where the boundary between work and community (micro and macro) is experienced seamlessly by a committed and engaged workforce. In order to get there however, it will be necessary to expand our design and spatial vocabulary to create room for the practices that underpin community. The metaphor of the village can provide both framework and insight: the gate (soft boundary/welcome), the main street (commerce and meeting), the market square (gathering and exchange), the inn (welcoming visitors), the meeting hall, the school (teaching and learning), the pub and other special places that express community identity, beliefs and values that define the work community and its connection to larger communities, local and global. 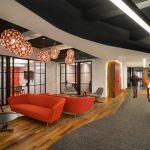 Many of these spaces already exist in the workplace, as amenities or branded elements, but they are often peripheral to the workplace. What if these “village” spaces formed the backbone of workplace? How different might the workplace look when viewed through the lens of community? An “inner circle” gathering at B+H Seattle. Image courtesy of B+H. What’s needed is a new way of thinking about workplace that advances the social and cultural infrastructure necessary to create a sense of belonging and shared community. We anticipate that the private sector will, increasingly, take on community-building as a core-competency. Opportunities abound to create new environments and forms that will contribute to a renewal process, beginning to restore what has been lost. Imagine what might be possible in a community-inspired workplace that encourages the sense of belonging that Jurgen has so succinctly described in this important book.